Finished reading The Devil You Know by Mike Carey yesterday. 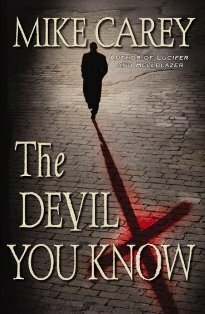 The Devil You Know is about Felix Castor is a freelance exorcist. The book takes place in modern day London but ghosts and other supernatural creatures are common place. While trying to retire from his exorcist career, Castor accepts a seemingly simple job just to pay the bills. What should have been a straightforward job rapidly turns into a hunt to kill Castor. I really enjoyed The Devil You Know. It was an entertaining read, a detective story that involved solving something other than your usual crimes. Parts of the book dragged on a little bit, but for the most part the book has a good amount of excitement and energy.